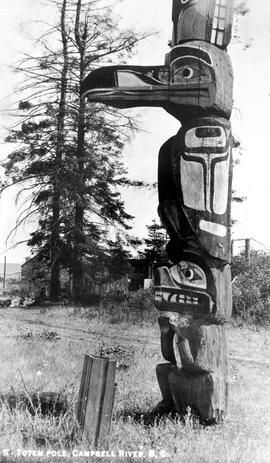 "Totem pole at Campbell River"
"Totem pole, Campbell River, BC." Church and houses in background. Eagle figure on top of monumental pole. One watercolour detail from monumental pole. One drawing of figure on top of monumental pole at Fort Rupert. Graves In The Indian Village At Salmon River. 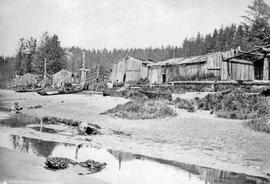 Indian Village Comox Vancouver Island. The highest carving has a carved wooden head suspended by the sinew of a deer in memory of his brave and daring feat in [waying? waylaying?] a family of eleven indians, men, women, and children and bringing their heads home to his lodge as trophies of his prowess. Berries were drying on the rude structures in front of their houses, made or pressed into cakes for winter use. Indian monumental carvings - Comox- V.I. [Vancouver Island]. Lower portion of D'sonoqua pole. One charcoal drawing of a Bear figure. [Indigenous] man, two women and two girls in front of entrance and carved figure. One charcoal drawing which relates to PDO00904.